Danielle Laraque-Arena, MD, FAAP, president and health system CEO of Upstate Medical University, is featured in the Black History Month exhibit at the state Capitol in Albany. In the exhibit, Laraque-Arena is highlighted as a Haitian-American leading pediatrician and researcher, whose career has focused on improving health in underserved neighborhoods. The exhibit, titled “Strength of Generations,” recognizes the 50th anniversary of the assassination of Dr. Martin Luther King Jr. and underscores how individuals can impact their communities for generations through service. Laraque-Arena was named the president of Upstate in September 2015, and assumed the role of president Jan. 14, 2016. Upstate is the only health science university in the Central New York, a public institution of higher education, serving a population of about 1.8 million with four colleges (medicine, health professions, nursing, graduate studies) and the region’s largest employer and health system. Dr. Danielle Laraque-Arena, a nationally renowned pediatrician and researcher who emigrated from Haiti, is the president of SUNY Upstate Medical University in Syracuse, the largest employer in Central New York. Laraque-Arena, who is the first woman to hold that position, credits witnessing poverty in her home country and her family’s experience as political exiles with shaping a career focused on improving health care in underserved areas. Laraque-Arena was born in Port-au-Prince, Haiti. She told the Post-Standard her family was educated, with “no property, no money, no businesses.” Her father, a poet, was an outspoken critic of the dictatorship of François Duvalier, and, in 1961, seven-year-old Laraque-Arena and her family moved to New York after the regime in Haiti began targeting dissidents. Settling in Queens, Laraque-Arena’s mother worked as a clerk at the United Nations and her father worked as a parking attendant while attending school at night. Her father’s eventual position at Fordham Preparatory School allowed Laraque-Arena and her brother to attend Fordham University for free. Laraque-Arena, who is fluent in English, French, Creole, and Italian, earned her medical degree at UCLA in 1981, where she had received a scholarship. As president of Upstate, Laraque-Arena oversees four medical colleges, a research institution and the Upstate University Hospital, with more than 9,000 employees and 1,500 students. Laraque-Arena treated the health impacts of poverty at an inner-city hospital in Los Angeles and studied the effects of lead poisoning in Philadelphia. Until her 2015 appointment to SUNY Upstate, she chaired the pediatrics department at Maimonides Medical Center and served as vice president of Maimonides Infants and Children’s Hospital of Brooklyn. 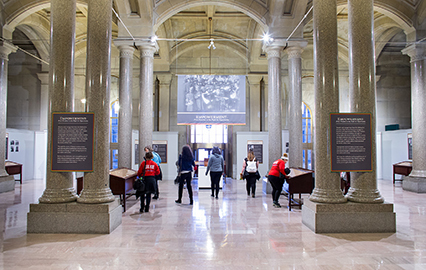 The second floor of state Capitol building in Albany features a Black History Month exhibit highlighting influential African-American New Yorkers. Among those featured is Upstate President Danielle Laraque-Arena, MD, FAAP.